My "method" for tracking fuel reward questionnaire opportunities my seem somewhat haphazard. But it's been working for me for a couple of years, now. One grocery chain encourages its customers to fill out online surveys concerning their shopping experience. As a reward, you earn 50 bonus fuel reward points. The drawback is you can only partake in one survey for points every 7 days, and each receipt's survey offer is only good for 7 days past the shopping. If I shopped on a very regular basis, this wouldn't be such a problem. Filling out the surveys might become a regular task for a particular day of the week. But I shop at this store when I happen to be in that area. Sometimes I shop just 4 or 5 days after the last visit. And I can't fill out a survey just yet, when I might be thinking of it, as 7 days has not elapsed since my last shopping trip. I've come up with a system, of sorts. I keep the current receipts on the table right next to where I store my laptop. Organization experts would probably recommend keeping these receipts on a desk, right? I don't happen to use a desk daily. And if I'm not carefully tracking when the next opportunity to fill out a survey opens up, I could miss it altogether. As this is an online survey, I need to use my laptop. By keeping the current receipt right next to the laptop, I see it daily and am reminded of the survey, every morning. 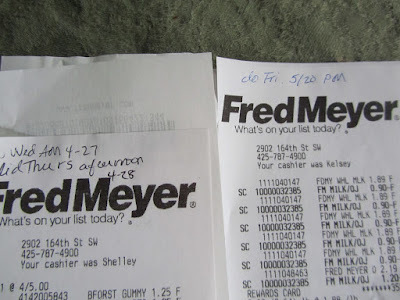 To track the survey window, I make some briefs notes at the top of each receipt. I first consult the previous receipt to see when I took the last survey. 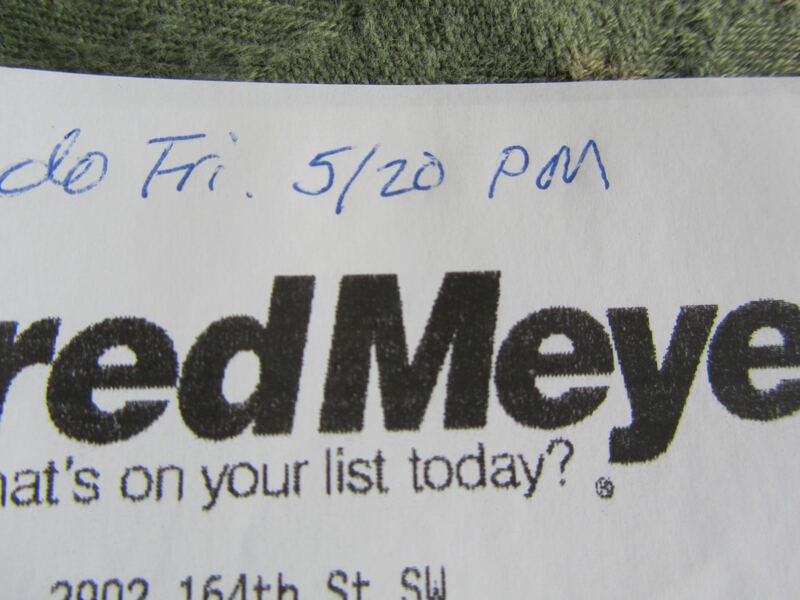 I then date the current receipt with the "do" date. After I complete the survey, I record the date I completed the survey, and whether it was in the AM or the PM. The previous receipt is filed in my folder of receipts, and this current one becomes the one sitting next to the laptop, to tell me when another survey opportunity will open up. I suppose many organization experts would tell me to write this information down on a calendar or in an appointment reminder. I suppose I could. But that would make extra work for me, and may just be enough "extra" work to prevent me from doing any of this. If I've learned anything about myself it's this, make something more complicated than it needs to be and I'll surely drop all of it. My solution is as simple as I can make it, yet still be effective. It works for me, and has for quite a while now. It's what I think of as haphazard organization. What you do to stay organized works for you, and that is what is important, Lili. I think we all have our own ways of organizing in a way that works for our own brains. Good job on the receipts for fuel points! I agree, whatever works, simply works. My daughter studied business in college and does the book keeping for several business meanwhile I use a notebook to keep track of my bill and receipts. She has tried to get me to use a spread sheet but I prefer my method. Whatever works best I always say . What a coincidence! That your daughter would suggest you use a spread sheet. I use spiral-bound notebooks for our budgets. My H frequently has suggested I do spreadsheets on the computer. But that just sounds like even more work to me, when my own method has worked fine with no issues, whatsoever, for 2 decades. Your method seems to have worked just fine for you. I've found the computer a great way to stay organized, with that sticky note feature on my laptop. Beats having paper lists. But I do what you do too. Sometimes it is just easier to jot a quick note on a receipt. To keep track of my gift card balances and store points program, I use the receipt itself. For gift cards, I keep all the receipts for a particular gift card clipped together until the balance is used up. For store points program like Walgreens Balance Rewards and SYWR, I cut the bottom of the receipt and note any other additions like doing healthy activities, surveys, reviews, sweepstakes, etc. or subtractions like online purchases that don't involve a store receipt and keep a running total there. Helps me know when I'm not getting all my points and I can promptly call to rectify. I also note on my laptop sticky notes program any key specific dates, and I can rearrange the list in order of most important to do. I also know myself like you to drop doing things that have so much work for so little reward. But as a frugal tweaker, that bar can be quite low. At several stores where I've used gift cards, the clerk has used a Sharpie to write my new balance on the card. I should start doing this myself. Currently, I do as you do and keep the receipts with each card. I have a separate pocket on my purse where I only keep gift cards and their receipts. It's been a "system" which has worked for me, so far. I do like using the computer to make lists of general to-do items. Sounds pretty organized to me and it seems to be working. I don't have an opportunity like filling out a form for extra points, but I can imagine what I would do. I would just fill out a form every time I got a receipt. And if that wasn't too much work (just a minute or two), I would depend on the form to tell me if it was too soon or not. Yes, I definitely go for the path of least resistance. It does work, for me, even if it doesn't look organized to anyone else. Unfortunately, these receipts/surveys aren't the kind which will automatically spit out any surveys completed prematurely. I wouldn't know for a few days if the points were not added, had the survey time period not been a valid one. But this works, and that's what counts.